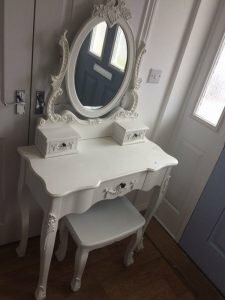 A hand painted white, heavily carved solid wood vanity dresser and matching stool. 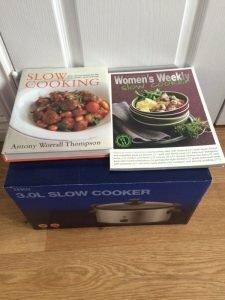 A brand new boxed stainless steel and glass 3 litre slow cooker, together with recipe books. 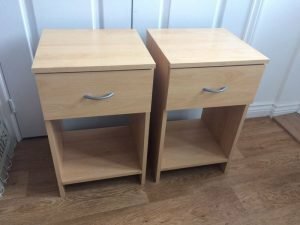 A pair of solid pine bedside tables, each having one large drawer above a shelving area. 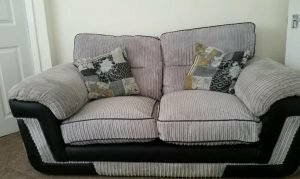 A two seater high back sofa, upholstered in black faux leather and grey corded velour. 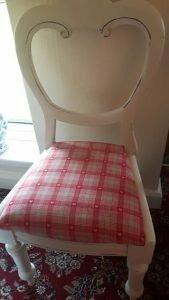 A vintage hand painted cream solid wood bedroom chair, upholstered to the seat in red patterned fabric. 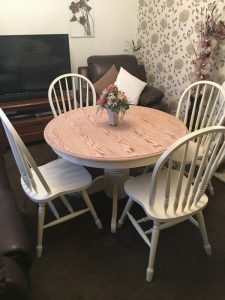 A hand painted cream solid wood circular dining table, together with four matching curved back dining chairs. 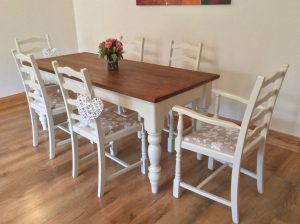 A hand painted cream solid oak rectangular dining table, together with six low back dining chairs. 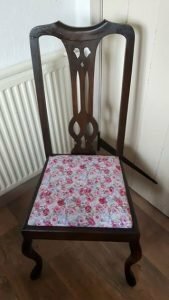 A vintage high back solid oak hall chair, reupholstered to the seat in rose patterned fabric. 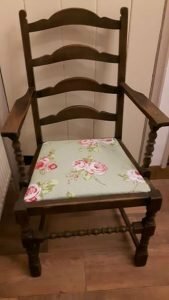 A solid wood vintage high back hall chair, reupholstered to the seat in floral patterned fabric. 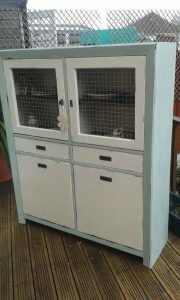 A hand painted white and duck egg blue solid wood dresser, a glass inlaid double cupboard above two small drawers and two cupboards. 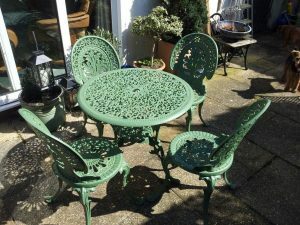 A hand painted green cast iron circular garden dining table, together with four matching curved back dining chairs. 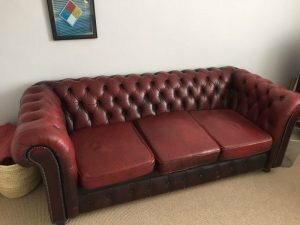 A three seater low back Chesterfield vintage sofa on solid wood feet, upholstered in ox blood red authentic leather. 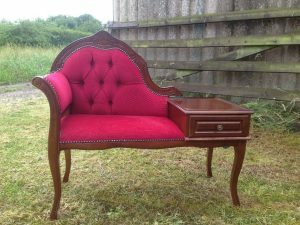 A solid mahogany high back vintage telephone table and seat, upholstered in red fabric. 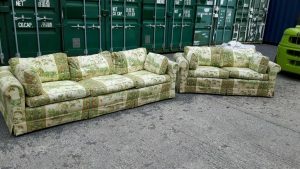 A three seater low back vintage sofa and matching two seater sofa, upholstered in floral patterned green fabric. 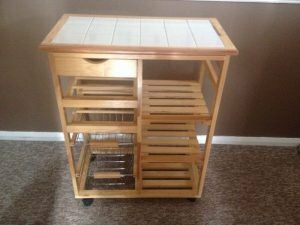 A tall standing solid pine tile topped butchers block, having one drawer above five shelves and two wire drawers. 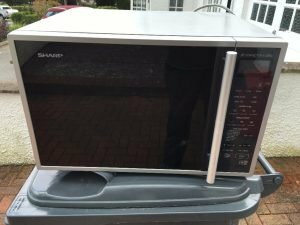 A white and black glass 900w Sharp Jet convection microwave. 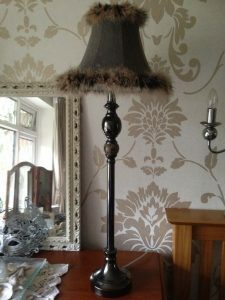 A tall standing black solid wood vintage boudoir table lamp and fur lined brown lampshade. 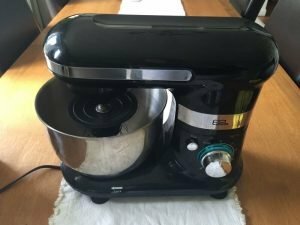 A black high gloss and stainless steel EGL stand mixer. 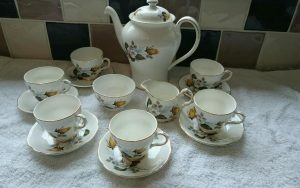 A vintage floral patterned fine bone China tea service, to include a large teapot, a milk jug, a sugar bowl, six teacups and six saucers. 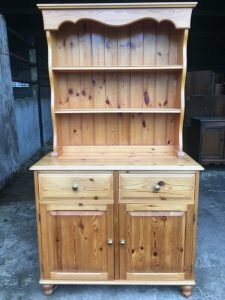 A tall standing solid pine vintage kitchen dresser, having two shelves above two drawers and a double cupboard.